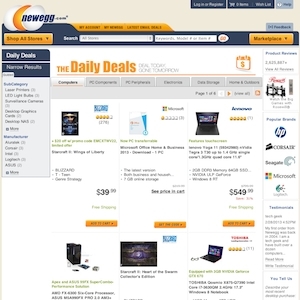 Newegg has been saving people money on electronics and computers since 2001 and their daily deals and Newegg Shell Shocker make it even easier to save big on just about any given day. Newegg also has a very dedicated customer base. According to Wikipedia, in 2010 Newegg had revenue of $2.5 billion and net income of $24.9 million. Newegg.com currently ranks #7 amongst sites offering online deals -- Home Depot ranks #6. In the Computers and Electronics category, Newegg ranks at #1.